The Hunter class makes it debut with a tier 3 set that vaguely resembles the rogue netherblade tier with its protruding jaw helm. Tinted with earth tone browns the set is unique if a little plain, but extra points for the red eyed helm, a first of its kind, and subtle glow effect shoulder pads. There are better sets to be sure… Okay who am I kidding, the set is kind of ugly, right? It looks as though you fell in mud (or some other brown substance) while “hunting” your prey. However sometimes diversity is about having even the options that only a mother would love and this set most certainly qualifies! If you want diversity just put the Cryptstalker gear on and you will not look like every other Hunter… of that you can be sure. 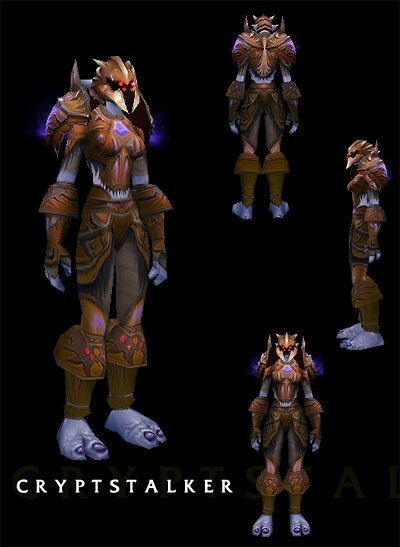 All kidding aside, the Cryptstalker set is still unique and would be a welcome alternative set for many a Hunter. As such it deserves our number 23 spot. This entry was posted on May 15, 2011 at 11:13 pm and is filed under General, MMO, Role Playing, World of Warcraft. You can follow any responses to this entry through the RSS 2.0 feed. You can leave a response, or trackback from your own site.